Contest Entry: Disney contest - Tinkerbell - Cherry Colors - Cosmetics Heaven! I wanted to do a simple contest entry for the beginning.. And I thought that the Disney themed was perfect for it! On a second thought.. most girls made some awesome make up looks, so I don't stand a chance, ahahah... Anyway Tinkerbell has a really simple and clean look. I may overdid it, but I love exaggerating.. uh. This was my 2nd time ever to use false lashes! yay for me! This is the first time you'll actually see my full face. Oh nooo! I was thinking if that's a good idea, but hell, why not?! I didn't use any foundation as for it, but I used the mushroom BB cream instead. I didn't have any green dress/shirt so I got just semi like portrait photos. (click on the pictures for view the full size!) I am not naked, I am just wearing a tank top. 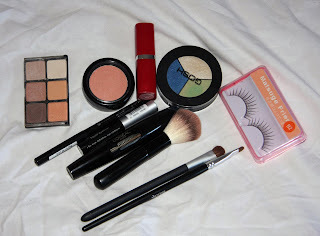 Here are the items I used (of course the lashes are not exact the same as I used, because I'm wearing them ahemm..) * Blush brush * Small crease brush * Bigger eyelid brush * False lashes * Two shades of brown from the no brand palette * No brand blusher in orange * Gosh trio eyeshadow - I used the lightest color for the highlight * Black Essence pencil * Black Essence eyeliner * L'Oreal Collagene mascara * Maybelline lipstick in 411 Windsor Rose (which is almost exactly the same color as my lips are naturally) The Disney contest can be found here: Click me! I am not sure about it, but okay.. I tried ;). The photos are a courtesy of my dear.